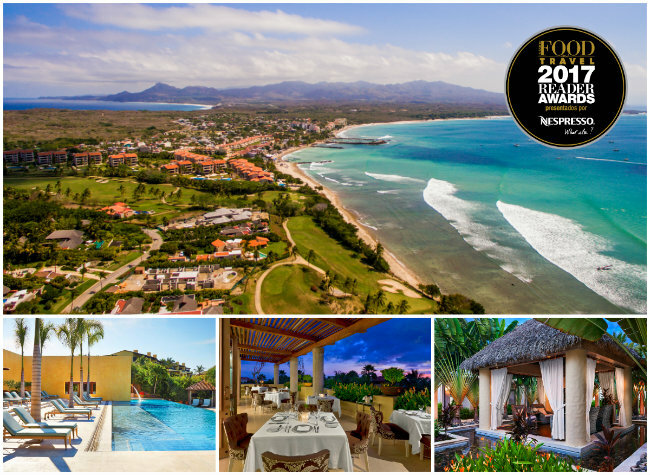 Vote for the Four Seasons Punta Mita or The St. Regis Punta Mita Resort in the categories of Best Beach Hotel in Mexico, Best Spa and Best Hotel Restaurant, and win a trip to Peru. Two of the Riviera Nayarit’s hotels, Four Seasons Resort Punta Mita and The St. Regis Punta Mita Resort, have been nominated for Food and Travel Mexico’s 2017 Readers Awards. Both hotels, located on the Riviera Nayarit’s Glamour Peninsula, are nominated for the category of Best Beach Hotel in Mexico. The St. Regis’ Remède Spa was also nominated for the Best Spa category for “the best facilities in Mexico offering a holistic experience for body and soul,” and the hotel’s Carolina restaurant is up for the Best Hotel Restaurant category. Punta Mita has the most exclusive tourism resort in Mexico and it continues to appreciate, as do its hotels, which continue to stand out on the international stage and spearhead the luxury positioning of the destination. These resorts are currently competing with five other beach hotels in Mexico, as is the spa and the restaurant, so your vote is very important! In the three years since they began the Food and Travel awards have become a benchmark in the tourism and culinary worlds, presenting a list of the top chefs, restaurants, hotels, destinations and gourmet eateries selected by readers themselves. In the past three years over 100 thousand people have made their opinion known by choosing their favorites. Food and Travel is giving away a luxury trip to Peru for this fourth edition of the awards.